← Jane Cibelli – First Woman to Win Monmouth Training Title. During the Monmouth Park meeting, which began on May 14th, and ended on November 6th, I took on the roll of a public handicapper for one specific wager, the new 50¢ Place Pick 6. This was basically a weekend only meeting that had 67 actual days of racing. I had never tried to publish selections and keep careful records that were publically posted on a consistent basis. I gained tremendous respect for the people that consider themselves public handicappers. It is very difficult to make a serious and thorough effort to handicap an entire meeting. The Monmouth meeting was probably a bit easier because it was only three days a week. Analyzing Friday was more relaxed because I could get those past performances on Tuesday, but then Saturday and Sunday came right after and without the extra time. The spreadsheet shows my results for every single day that I played the 50¢ Place Pick 6. The results are based on the exact ticket that I posted in my blog. There were a couple times where that ticket got scratched but I was able to make a betting change and then hit the PP6, but I didn’t include that in my spreadsheet because I did not have a chance to post the change in the blog. I found the process of figuring out the most effective way to construct a PP6 ticket to be creative and exciting. You can see that for the first 39 days of the meeting I was experimenting with the size of the tickets. Then I settled on the $36 ticket with a structure of: 1 x 2 x 2 x 2 x 3 x 3. That represents the number of horses I used in each race. Of course the arrangement of those numbers could vary. You can see that once I stuck with that ticket structure for most days in the second half of the meeting that I hit the wager 10 times. For the entire meeting I was successful 14 times and ended up with a profit of $150. Anytime a public handicapper can end up in the black for a significant number of days that is an impressive accomplishment. I am quite proud of that achievement and that I was able to complete this long-term handicapping task. 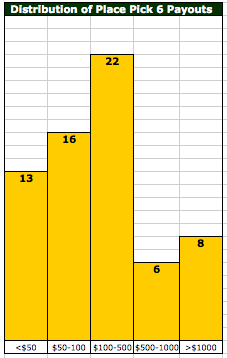 The graph shows the range of payout prices for the 50¢ wager for the entire meeting. There was a fairly statistically regular distribution especially from May through August. The largest payouts happened during that time period. On August 27, the highest price of $6,404 occurred followed by payouts of $4,846, $3,390, and $3,065. In September when the summer tourist season ends at the Jersey Shore, the overall handle at Monmouth goes down and so did the PP6 payouts. In the last three months the topper was $1,605 and the payouts began to skew to the smaller prices on the left. If you think it was easy to hit the Place Pick 6 you should keep in mind that there were four days that produced a carryover pool. On those days nobody could get six consecutive races when they picked a horse to place. I will be interested to see if the Place Pick 6 returns in 2012. If it does come back I will definitely play the wager again. Next summer I will probably try a new handicapping challenge. If you have any suggestions let me know! Kudos, Andy! Anything on the plus side is good, and it’s a credit to your handicapping that you hit so many multi-race winners. Do you think the wager is worth it at a place like Monmouth, based on your experience? It seems like the reward (granted, a place finish keeps you alive) is pretty light considering the number of scores you had. Hey, thanks for the comment NJHorseplayer. 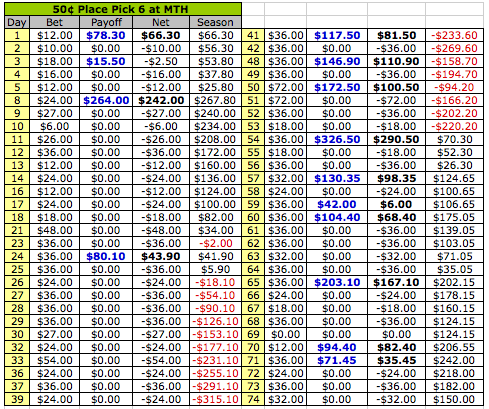 I went into the PP6 with a kind of pioneer mentality as it was when the Pick 5 first appeared at MTH in 2007. That wager began slowly and then took off. I don’t really think that the PP6 will become the kind of wager that has big payouts, but I did and still do think that the PP6 is a great wager to introduce newer players to the multi-race betting. Monmouth has so many casual on track players that seem to be a good target for the PP6. Arlington of course has their Place Pick 9! I don’t have the bankroll to attack the Pick 5 on a daily basis. In 2010 I had a partner in the Pick 5 and we did pretty well. Monmouth didn’t do a very good job promoting the wager or anything else this summer. I sensed that everyone there was worrying about the future. Read your BC2011 stuff and Turallure was a key horse for me too. I haven’t evolved to Twitter yet, Andy, but may consider. A lot of great information is exchanged by the Twitter horse racing crowd.